Who attends? The local expat community of course, but also French friends and other Europeans, travellers, house guests and, in one case, invited members of the American military stationed in the area. Many French friends have told me they love the idea of celebrating this very-American tradition; at a friend’s Thanksgiving a few years back, the Frenchman to my left said he loved how the various dishes were served all at once, all on one plate, rather than in courses. Another said he was looking forward to his first taste of cranberry sauce, which he called red fruits jam. You’ll see I’ve also included a couple Thanksgivings in Paris, including one where you’ll cook some of the dishes yourself…and a link for finding others. For those of you cooking at home, I’ve provided two great sources for all your Thanksgiving supplies, including fresh cranberries, fresh yams, stuffing mix, pumpkin pies, pecan pies and of course, the big juicy bird. If you’re hosting a Thanksgiving in the South of France that’s not listed here–or know of one–feel free to email me the info and I’ll add it: provenceblog@aol.com. * The cooking school and foodie gathering place called La Serviette Blanche in Cannes will be offering an elegant Thanksgiving feast–with a French twist–on November 24th at 7:30 pm. The price of €69 pp includes a welcome Kir Royale with nibbles and a four-course menu ending with coffee or tea; wines are extra. All ingredients are seasonal and market fresh. Le Menu: sweet corn velouté with crispy bacon and crème fraiche, slow-roasted turkey breast basted with butter and white wine, gravy, stuffing, cranberry compote, sweet potato gnocchi with maple and sage, Chardonnay-glazed carrots, sage corn bread and French green beans. For dessert, there will be a gooey pumpkin cake with homemade vanilla cinnamon ice cream. Reservations and advance payment are required. To book: visit the website linked above or email: info@laservietteblanche.com. * The American Club of the Riviera‘s Thanksgiving in Monaco is a gala, annual affair…large, elegant and extremely popular. It’s Thursday, November 24, starting at 12:30, in the the splendid Salon Bellevue at the Café de Paris. As in year’s past, members of the US Army will be the special guests. All the info is here. Be sure to reserve early as the event is always fully booked. For those who’d like to join the ACR, they’re offering a special 14-month membership for new members so you can be sure of getting in to Thanksgiving. The Menu: Turkey with stuffing, cranberry sauce, creamed onions, sweet potato, peas, corn on the cob, corn bread and a selection of pies (apple, pumpkin, pecan) and brownies. The price includes a glass of wine, beer or soft drink and coffee. Space is limited and places can only be reserved for those paid in advance. Members of MonacoUSA pay €45; non-members €50; kids under 12, €20. To reserve: rsvpmcusa@gmail.com. 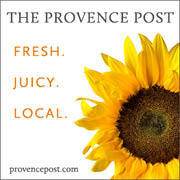 * The Anglo-American Group of Provence is once again welcoming the community to celebrate Thanksgiving “with a spirit of appreciation for all that we share.” The party is Sunday, November 27 at 4 pm (aperitif) and 5 pm (dinner) at Restaurant Le Verguetier, 7 chemin d’Eguilles in Celony (Aix) across from the Maison de Ste-Victorie (restaurant phone 04 42 23 11 56). They’ll have all the traditional foods: turkey with stuffing, cranberry sauce, mashed potatoes, green beans, sweet potatoes, and pumpkin pie with whipped cream. Cost: 29€ members, 10€ for their kids under 12; 36€ for non-member guests and 18€ for their kids under 12. This includes aperitif, the meal with desert, wine and coffee. To book: Please specify the number of adults and kids in your party, write a check payable to AAGP and send it to Mari-Luz Saboui, 25 Chemin de Masse, 13710 Fuveau. Checks must be received by Nov 21. Questions? Email to: bobkeltz@aol.com. * The Avignon Chapter of Democrats Abroad will gather for a festive Thanksgiving lunch on Saturday November 19, at L’Epicerie de Cecile on the Place de la Republique in Beaucaire (TripAdvisor ranks it the #2 restaurant in Beaucaire). Timing is 12:30 to 3 pm. Cecile herself will cook up the traditional Thanksgiving feast, as she has in years past. Menu: Pumpkin soup, turkey with stuffing and gravy, sweet potatoes, green beans, baked potatoes and cranberry sauce. Dessert is Georgia-style pecan pie. One glass of wine is offered, coffee is extra. Before lunch the group will gather for an apero at the Taurin Cafe (on the same square as the restaurant) between 11-12:30. Lunch is 20€ adults, 10€ kids. Seating is limited and you must reserve before noon Saturday, Nov. 12. To book: d.shibut@free.fr. * The Marseille Chapter of Democrats Abroad is hosting Thanksgiving in Aix at Biocoop – La Coumpagnie. The party is Thursday, November 24 starting at 7:30 pm. The meal will be 100% organic, 0% GMOs and 100% homemade from American family recipes! The evening starts with spiced wine and appetizers (stuffed mushrooms, deviled eggs), then moves on to the main event of turkey, stuffing, mashed potatoes, candied yams, green bean casserole (yes, with cream of mushroom soup! ), pumpkin pie, pecan pie and classic cheesecake. The price will be announced tout suite and wine and beer will available at additional cost. To book: +33 (0)6 81 34 85 74, parisrick@me.com. * Near Forcalquier, the restaurant Le Bistrot de Pierrerue in Pierrerue celebrates Thanksgiving on Thursday November 24 at 8 pm. On the menu: an amuse bouche, brined and roasted turkey with dressing (made from bio sausage and chestnuts), homemade gravy and cranberry chutney, mashed potatoes, roasted local Brussels sprouts, pumpkin pie, apple crumble and vanilla ice cream. Price is 25€ per person, without drinks. To book: +33 (0)4 92 75 33, 00, maryvonne.kutsch@orange.fr. * The owners of the lovely four-star hotel Mas Valentine in St. Remy tell me they’ll be hosting Thanksgiving again…and are working out the final details. I’ll post the info here when I get it…or you can email them: contact@masvalentine.com. * There seem to be a lot of Thanksgiving celebrations in Paris, ranging from the very-casual one at the Hard Rock Cafe to the very-posh one at Ralph’s, the restaurant in Ralph Lauren’s elaborately appointed store on the Boulevard St.-Germain. One that seems to be getting lots of buzz this year will be at Dune, where American chef Evan Leichtling (from Seattle, originally) is hosting Thanksgiving on Thursday November 24, with seatings at 7:30 and 9:30 pm. The three-course menu is 38€ and all the details are on the site. * If you can’t decide whether to cook at home or go out, the cooking school La Cuisine Paris has the perfect solution for you: a Thanksgiving cooking class (in English)…followed by everyone eating lunch together overlooking the Seine. Timing is 10 am to 1:30 on November 24 and the price is 120€ per person. * To find other Thanksgivings in Paris, you’ll find a good list here. * The Paris shop called Thanksgiving sells a wide range of American foods year round so of course they’re the Parisian go-to for holiday meal supplies. (They also stock Canadian, British and Mexican products, too.) They’re taking orders now for their fresh turkeys, homemade pecan and pumpkin pies and all the other ingredients you need to make your favorite dishes (including Libby’s canned 100% pure pumpkin). They also offer a selection of hard-to-find kitchen accessories (cheesecloth, roasting bags, measuring cups and spoons, pie plates, etc.). Note: Please be sure your online holiday orders are in by November 18. The store website is here and the online ordering site is here. Thanksgiving is located at 20 rue St. Paul, 75004 Paris, +33 (0)1 42 77 68 29, thanksgivingparis@orange.fr. * MyAmericanMarket.com sells pretty much everything you need to prepare your Thanksgiving feast, except the turkey: cranberry sauce, canned pumpkin, cornbread mix, stuffing, gravy, corn syrup, and more! They have lots of ingredients and treats for other holidays, too, including eggnog and candy canes. They are 100% online and will deliver anywhere in Europe. You can order right up until noon on November 23rd and get your goodies shipped to you in France on Thanksgiving Day! “But then you’d need to be a very efficient chef!” as Therese at the company tells me. Specific Thanksgiving foods are on a special page here. 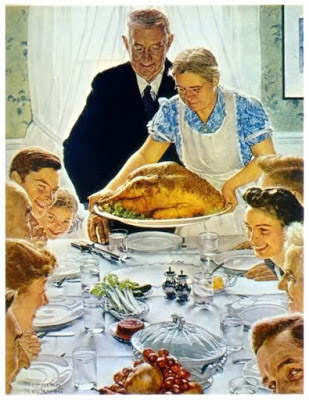 Above: The much-loved, often-parodied painting is Norman Rockwell’s “Freedom from Want” from 1942. Everyone in it was a Rockwell family member or friend; they were photographed individually and painted into the scene. Learn more about the painting and artist here.